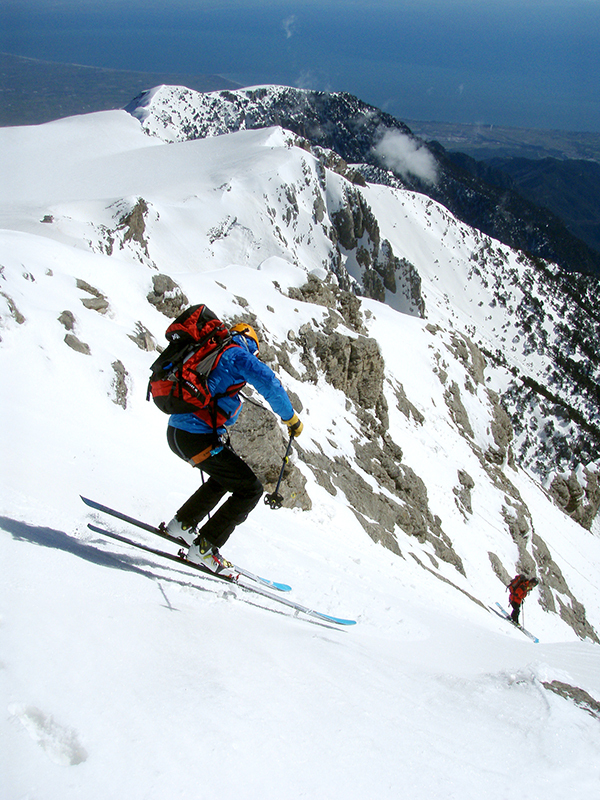 Conditions Stabilizing on Mount Olympus…and in Greece too! 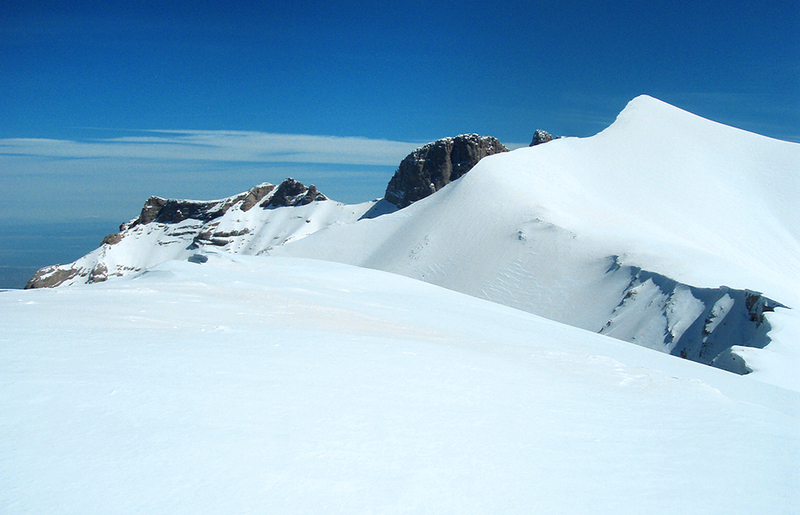 The view from Mount Olympus summit…blue sea, blue skies! Mountains are dynamic systems. Climatic patterns around the mountains are also dynamic and complex due to a variety of factors including location, topography, proximity to the sea etc. Humans have to adjust. Mount Olympus Highs. Clockwise from left. Mikri (Petit) Toumba, Toumba, Stefani, Mytikas and Skolio. This winter Mount Olympus got continuously attacked by alternating wet/warm and cold/dry climatic regimes and by almost never stopping, high-velocity winds of various directions…and so did Greece in terms of politcs and society. Calm days amounted to less than 10. Such successive alternating and intense meteorological conditions resulted in increased amounts of snow accumulation mainly on the lee side of the wind-swept slopes and consequently, to the creation of large cornices and instable snowpack conditions. Abrupt increases of temperatures released big-scale avalanches that swept the major valleys. The valley of Megala Kazania chocked with avalanche debris released after warm interval that ultimately makes ski descends not very pleasant. However, the couloirs on the right-hand side of the photo await first descends. During the last two weeks several Mount Olympus classics saw human presence. 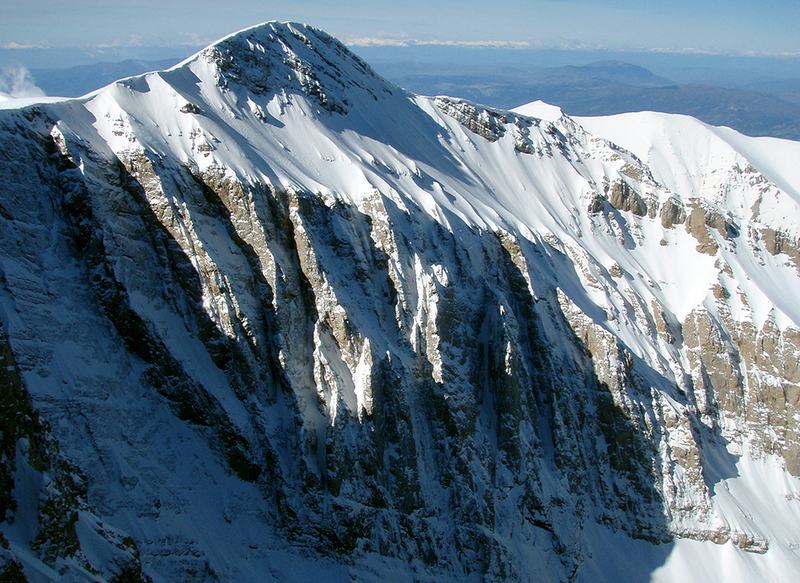 The Comici-Escher route (M3, 70o, 200m) on the east face of Zeus Throne (Stefani) was repeated by fellow climbers Bojan Mitanoski and Nikola Andonoski from FYROM, while a bunch of French skiers had their prime time on Mount Olympus by successively skiing the couloirs of Mytikas and Stefani (45-50o), in perfect spring conditions. 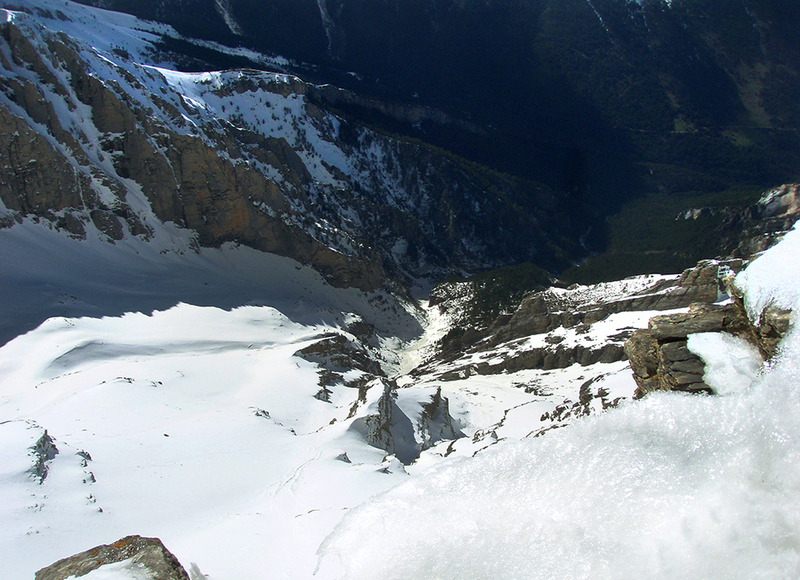 The neighboring to Comici-Escher and also classic goullote Schwab-Aglliardi (M4, 80o, 200m) is also filled, with good ice conditions, while a frozen waterfall has appeared above the second pitch of Axladi (IV+/V, 180m). The north face of Skolio is still in immature climbing conditions with plenty of snow accumulated in and above the classic summer routes and under certain circumstances (which seem to prevail the last week) can provide exciting and high-intensity climbing moments. The ascents to Mytikas (2918m) amount to more than 100 for the current season from climbers of different nationalities (Greece, FYROM, Serbia, France, UK, Austria). 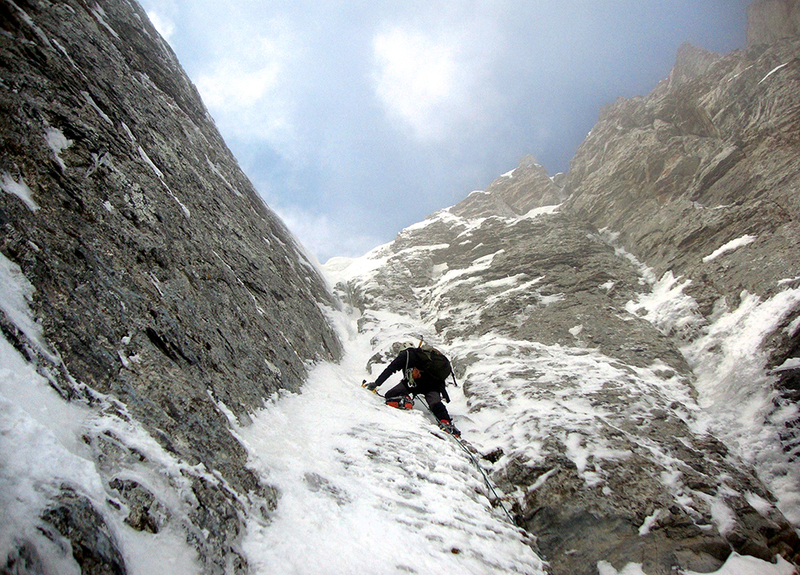 The east face of Stefani in great climbing conditions. Forecasted freeze-thaw cycles in the weeks to follow may enhance the icy parts of the routes or disappear them at all, making climbing in any case even more elusive. 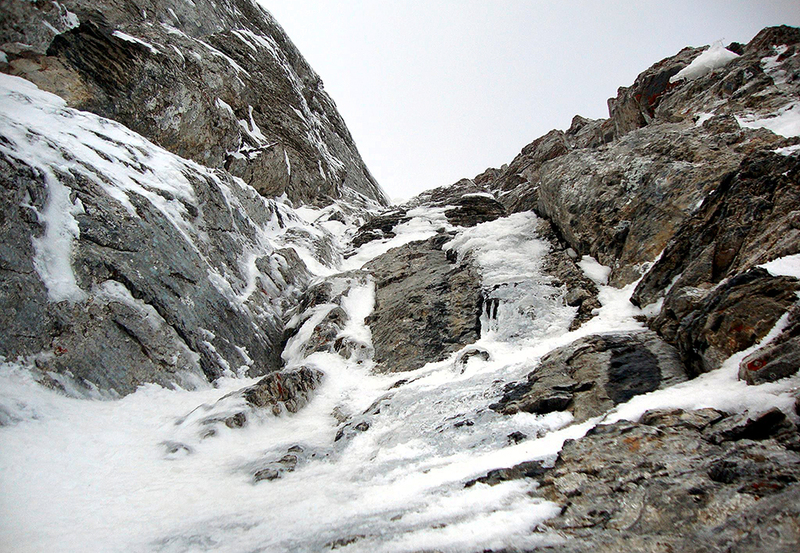 The crux (beginning of 4th pitch) of the Comici-Escher route (Photo © Bojan Mitanoski & Nikola Andonoski). 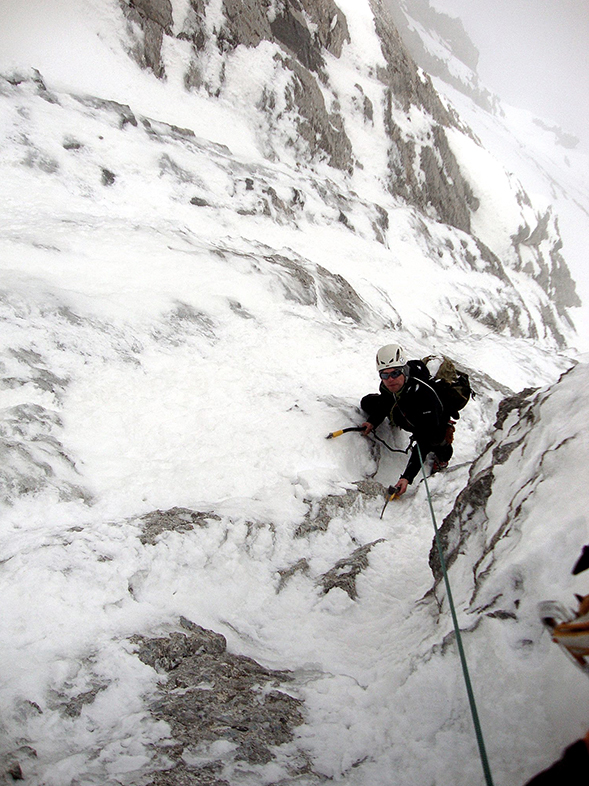 On the last meters of the 4th pitch (Photo © Bojan Mitanoski & Nikola Andonoski). The last (5th) pitch of Comici-Escher route in perfect climbing conditions (Photo © Bojan Mitanoski & Nikola Andonoski). 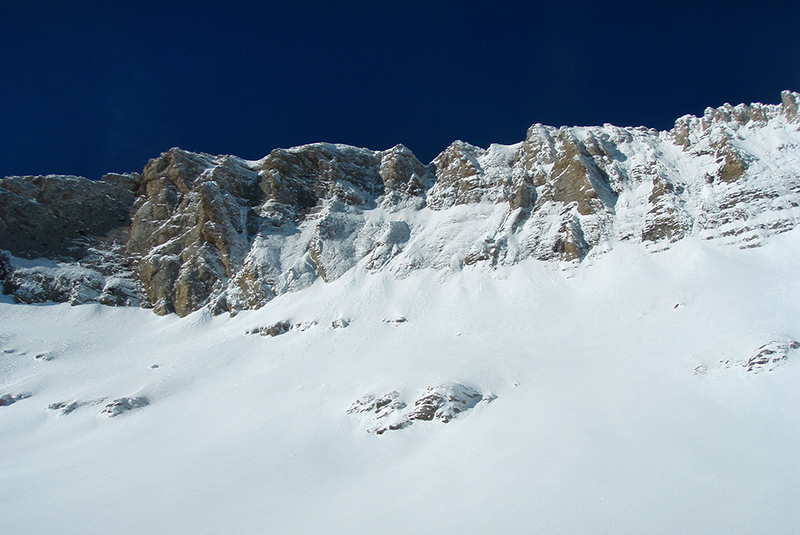 The north face of Skolio, with increased snow accumulation awaiting for future attempts. Bonjour Alain. Chamoniards Alain Veillard and Jean-François Fellouse entering the couloir of Stefani (route name “You Laugh?” named after Austrian extreme skier Eva Walkner who achieved the first descend), having departed from the cairn situated on the peak’s subsidiary summit. As spring arrives and freezing level has started periodically to creep above the highest peaks (ca. 3000m), snowpack conditions have began to stabilize providing stable and safer conditions. The arrival of another cold front will potentially create favorable climbing conditions even in the north face of Skolio. The next scheduled opening of Christos Kakkalos refuge will take place between April 23rd and May 3rd giving a last chance (weather permitting) of yet another week of skiing and winter climbing, concluding in this way a climatically, socially and politically spicy, albeit very interesting Greek winter.